Mohammed Alshaali, Chairman of Gulf Craft wins another global recognition for his remarkable contributions to the world’s leisure marine industry over the last thirty-six years. 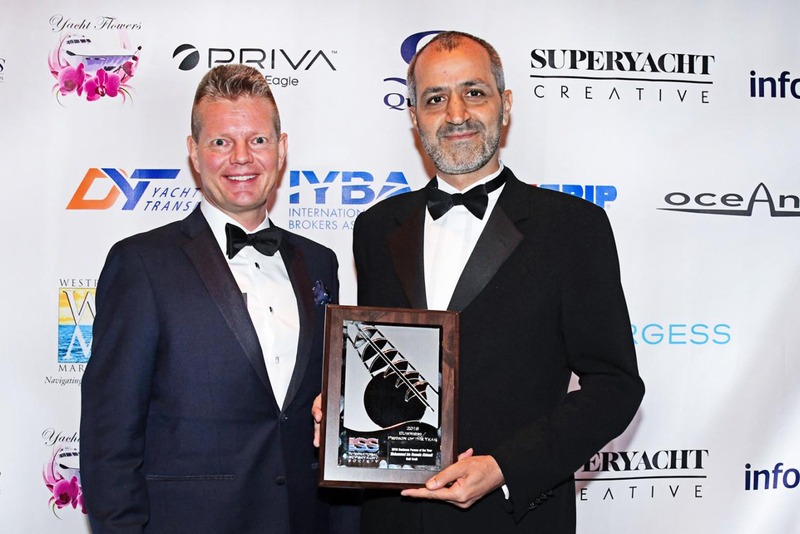 The International Superyacht Society recognizes him as the Business Person of the Year at the 28th ISS Design & Leadership Awards Gala event held on 31st October 2018 in Florida, USA. A proud moment that opens a new chapter for Gulf Craft, the award highlights Mohammed Alshaali’s pioneering work and relentless efforts to create sustainable growth for the maritime industry and its establishment as a key pillar of the manufacturing industry. Over the decades, he has helped to enhance the footprint of Gulf Craft from being a regional boat manufacturer to a globally and highly respected shipyard that ranks in the top 10 superyacht builders of the world. Today, Gulf Crafts’ boats, yachts and superyachts sail the oceans of the world and fulfil the needs of diverse customers around the world. Mohammed Alshaali started his career as one of the UAE’s key diplomats holding positions such as UAE Ambassador to the USA, representative of the UAE at the European office of United Nations in Geneva and many more. Alshaali finally served as a Minister of State for Foreign Affairs before retiring and devoting his full time to Gulf Craft in 2008. ISS was founded in 1989 to represent a growing yacht industry worldwide and to ensure sustainability and excellence by building global alliances. The society also aims to recognise achievement with annual peer-reviewed awards programme as well as provide educational opportunities and networking events. The other ISS yacht design and leadership award categories that recognized outstanding people for excellence in their area of superyacht expertise included the Distinguished Crew Award, Leadership Award, Awards of Distinction, Excellence in Innovation and ISS Fabien Cousteau Blue Award.